Before you start setting up FTNOIR you have to make sure that below list is all check ! For fully working software you need the basic program plus the 3 point tracking plugin. As the FTNOIR on its own is delivered with 1.0 version of the point tracker plugin, you need to download the newest (1.1) version as well. Exclusive for our customers only! See your shipping confirmation email for password to the file. Install the main program, using ‘install all objects‘ when selecting components, scroll down the bottom and untick VirtualJoystick as this one is not required. If you use 32 bit version of the Windows just omit the (x86) bit from the path, overwrite if asked for it..
with the one you have just downloaded. The software for head tracking will not discover any device connected to an USB HUB, so before you start, make sure your PS3 Camera is connected to an USB PORT on your motherboard directly. 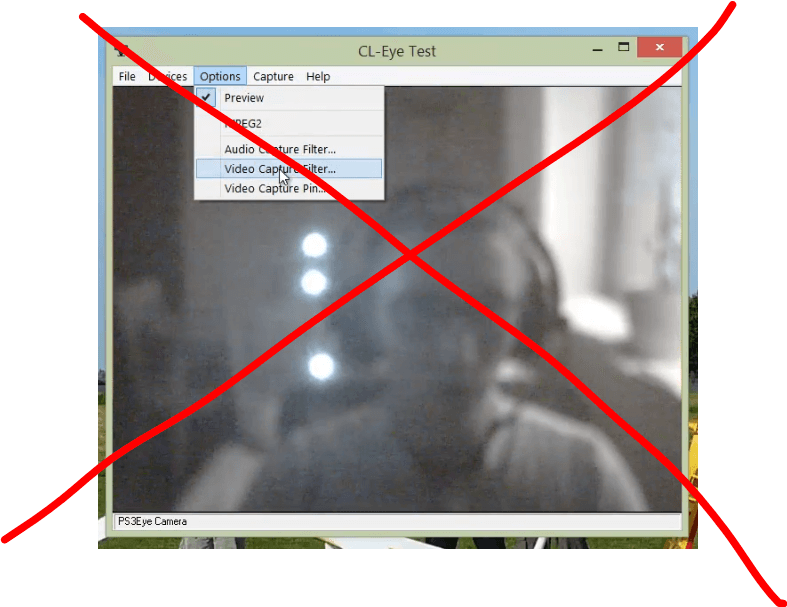 Make sure you are not running any other application which may be using the PS3 Camera (especially CL-Eye Test must be closed), as this will prevent the games and facetracknoir working properly ! Now, we are ready to setup the software ! 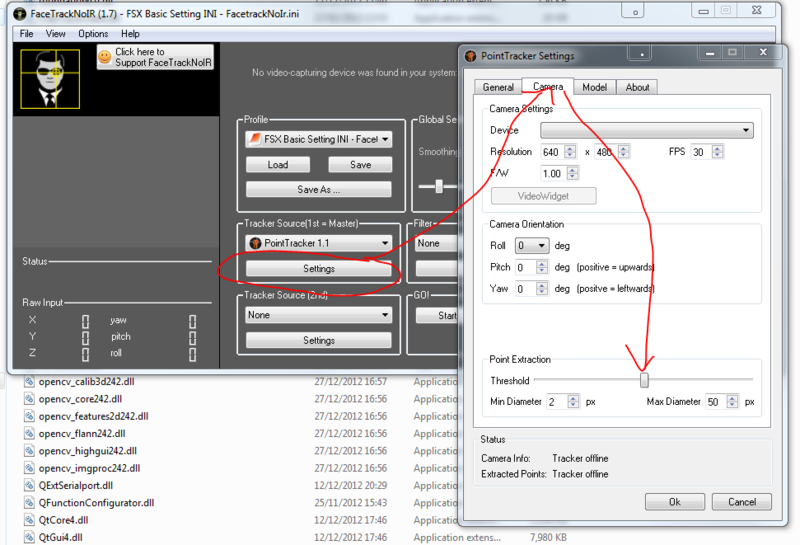 Below is a window shown when you run your FTNOIR software, please follow the four simple steps shown on the right side. It will start the tracking process, make sure you direct delanclip LEDs straight onto the camera eye. When clicked you will see the pop up window with variety of options. Press START, then go to THRESHOLD as below. Make sure you adjust the threshold slider to get nice and round dots ! If you don’t do this – it will not work properly ! The camera used for tracking. This is very important to change it for the one you are going to use for tracking. The desired capture resolution. If your camera does not support the entered resolution the true output resolution may be different or even invalid. You may check the true capture resolution in the status area while the tracker is running. A higher resolution results in more accurate point positions and will increase the stability of the tracking result, as long as the signal/noise ratio is sufficiently high. The desired capture frame rate. Again, if your camera does not support the entered frame rate, the true capture frame rate may be different or invalid. You may check the true processing frame rate in the status area while the tracker is running. Will need to update this, but no need to change here ! Shows a resizable stand-alone video widget that shows the same content as the integrated video widget in FTNoIR. Update rate is only 10 fps and may lag behind a bit. Mainly useful during calibration of the point extraction. Same as for the integrated wiget, to save resources, this widget should only be shown when needed. The orientation of the camera relative to the reference frame. If these angles are setup properly, the direction of translations may not be correct. Roll is treated in a special way since it is implemented as a frame rotation by +/- 90 deg that is transparent to the rest of the processing pipeline. The threshold for point recognition. Areas above the threshold are shown in blue in the Video Widget. Since point accuracy is best if the points are as big as possible in pixels, the threshold should be chosen as low as possible (stop before the contour of the points becomes “noisy”). If small reflections are being falsely classified as points, increasing the minimum point diameter (see below) may help. Above settings are OK for a quick start with your DelanClip. So if you can not wait to try it, please skip to the: Lets try it in your game ! Time the tracking thread sleeps after each processed image. It’s inverse should be below the framefrate you want to achieve. (check the framerate in the status region when tracker is active, in case the sleep time is too high, the framerate will decrease). Low values will result in more CPU-load. Whether the point correspondence and pose ambiquity is resolved using a more sophisticated dynamic algorithm (constant velocity prediction) or a simple static resolution. Dynamic pose resolution can capture more extreme poses but may occasionally get stuck in a wrong pose estimates so that a reset of the internal state becomes neccessary. If no valid tracking result can be found when using dynamic pose resolution, the tracker will automatically reset its internal state (used for resolving the pose ambiguity and point correspondence) and return to a fail-safe initialization phase that assumes a neutral pose after this time. Decrease this time, if you get stuck in a wrong pose too often. Manually reset the trackers internal state used for dynamic pose resolution and return to a fail-safe initialization phase that assumes a neutral pose. You may use this in case you get stuck in a wrong pose. Which axis to use for FTNoIR. In this section you do not need to change anything as DelanClip has been manufactured with the default dimensions shown. You just need to make sure you chose Clip as your model. The vector from the model to the center of the head in the model frame. Can be calibrated automatically. Press the Calibrate button, then look around while not moving your shoulder. (i.e. only rotation, no translation). Do not stay in one pose for too long. The current translation estimate will be updated in real time. As soon as the values stabilized sufficiently, press the Calibrate button again to stop the calibration process. Lets try it in your game ! for the manual purposes I used the rFactor 1 demo, it is great to test how whole lot works ! Download my settings as a good start for rFactor 1: rFactor.ini, after downloading please unzip the file i.e. on your desktop. In main window on ‘profile’ section please click LOAD, choose the ini you just downloaded. 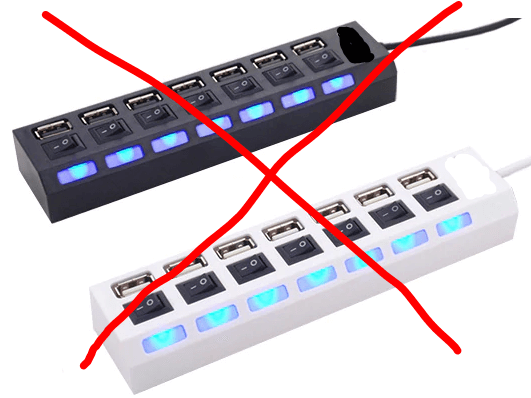 Plug the DelanClip into a free USB port. Run the demo game, and go to CONTROL -> Testing and then to ‘Load Circuit’ and finally RACE, now try to use DelanClip to look around. TIP: the view may not be centred but you can easy do this by hitting F2 button on the keyboard. TIP2: Remember you can still tweak curves to get better results, just have a play with all the settings, do not worry as you can save whatever you changed and go back to the original settings by calling back the INI files. Do not hesitate to contact me directly by our contact form and do not forget to like us on facbeook. There are known issues with specific games like Microsoft Flight Simulator. Please take a look at our games setup section, sometimes it can save you hours searching for solution !